Peter Biggar was the son of Patrick and Elizabeth Biggar. He was born in Addiewell, Midlothian, Scotland about 1897. Peter was living in Edinburgh when he enlisted in with the Royal Scots in Leith. Private Peter Biggar was serving with the 13th Battalion of the Royal Scots when he was killed on 12th June 1916. Newspapers reported that he died as a result of an accident. He was 19 years old. Newspaper reports confirm he had lived in Stewartstown, although he is not listed on Stewartstown War Memorial. 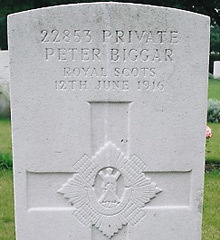 The CWGC record Private Peter Biggar as the son of Patrick and Elizabeth Biggar of Stewartstown, County Tyrone.